This is a four-part major series on New Zealand’s wines. Part II focuses on New Zealand’s North Island, part III visits the South Island and Part IV tastes 180 New Zealand Pinot Noirs. The stunning scenery of New Zealand is the backdrop to a wine industry that is minute in world terms, yet punches way above its weight with some of the planet’s most distinctive wines. New Zealand is also the dream destination for so many of us, with images of this spectacular country occupying pole position in that part of the brain that files ‘must dos’ into an ever-changing list. The Lord of the Rings effect has been enormous. Peter Jackson’s cinematic trilogy luxuriated in the awesome beauty of New Zealand’s mountains, lakes, forests and pastures. It celebrated a clean, green land, where the air is as clear as crystal, and the colours as vivid as an artist’s paintbox. This perception extends to New Zealand’s wines, and in particular, the Sauvignon Blanc of Marlborough. This is one of the most distinctive wine styles in the world, epitomising freshness and vibrancy: there is a phenomenal following for these wines with their pungent, green aromas and double whammy of exotic fruit salad flavours and grapefruity acidity. So far, New Zealand has worked its wine industry quite brilliantly. The average price paid for a bottle of Kiwi wine in the UK is around £6.00. Though six quid for a bottle may not break the budget for the wine enthusiast, consider that this is £2.00 more than the average price paid for French or Australian wines. New Zealand has positioned itself quite uniquely on UK shelves, keeping volumes low, but prices high, with a reputation for producing classy wines that is the envy of most other nations. But the price has had to be high. New Zealand is simply a place where it is very expensive to make wine. It is a tiny country on the edge of the world, with small vineyards, high labour costs, strict environmental controls, and a climate that is marginal. The costs of creating wines here bear little relation to costs in Chile, South Africa or the flatlands of Australia. Whilst Marlborough Sauvignon has undoubtedly been New Zealand’s greatest strength, it also has the potential to become a weakness. Marlborough is a rapidly and massively expanding vineyard area, and multi-national companies like Australia’s Fosters, the US Constellation Brands and France’s Pernod-Ricard all operate large scale wineries here. They are looking to drive volumes up way above New Zealand norms, and will use economies of scale to discount prices in order to gain market share. As the New Zealand wine industry is so dependent on Sauvignon Blanc (which accounts for around 70 per cent of plantings and exported wines), any move by Marlborough to slug it out with the three-for-a-tenner brigade will undoubtedly cheapen the product, and could be disastrous for smaller players. Personally, though I love the instant ‘hit’ of a glass of well-chilled Marlborough Sauvignon, an even greater disaster would be the public falling out of love with this very singular style. The typical style is not a food wine, and is rarely subtle or complex. Producers must avoid making this style a caricature of aromatic fireworks and a sweet ‘n sour onslaught of residual sugar and searing acidity. Could there be an ‘Anything But Marlborough Sauvignon’ backlash somewhere down the line? There is much more to New Zealand than Sauvignon Blanc. Chardonnay has always grown very well, especially in Gisborne, and Riesling does particularly well in Central Otago, Marlborough and Martinborough too. Pinot Gris is currently a hot ticket on the domestic market, with Hawke’s Bay one of the main centres planting and already making Pinot Gris in a rich, Alsace style. Viognier is coming on stream, and a new clone of Grüner Veltliner is causing much excitement amongst winemakers. A small, but high quality production of Riesling and Gewürztraminer still has a fanatical following. But the red wine grapes of New Zealand hold plenty of intrigue too, and with the global trend to drink red rather than white, red varieties are receiving lots of attention from winemakers up and down the length of the country. Hawke’s Bay on the North Island is the traditional home of red Bordeaux varieties, although the earliest days of its production were far from convincing. Cabernet Sauvignon in particular was difficult to ripen, and in some years overtly ‘green’ aromas and flavours were detectable. Today, better management of vineyards and a swing away from Cabernet Sauvignon to Cabernet Franc, Merlot and Malbec means the tendency is much less marked – though still evident in one or two wines on my recent visit. Esk Valley remains a model Bordeaux-style producer, whilst Alpha Domus, Crab Farm, Craggy Range, Gunn, Sacred Hill, Sileni, Te Awah, Trinity Hill and Vidal all had wines that impressed at recent tastings. Auckland and around was another Bordeaux grape stronghold, and Waiheke Island, just a few miles out from Auckland in its own warm microclimate, has some extremely good wines from producers like Stoneyridge and Cable Bay. Syrah is currently one of the most interesting red grape varieties on the North Island, with Hawke’s Bay’s ‘Gimblett Gravels’ district in particular showing evidence of real potential, as Paul Howard explains in our ‘spotlight’ below. Further south, Martinborough is a traditional stronghold for Pinot Noir, which has now perhaps taken over the mantle of New Zealand’s second most successful and recognised grape variety. Larry McKenna, one of the pioneers of New Zealand Pinot Noir at Martinborough Vineyards, now makes one of the best examples at his new project, Escarpment Vineyards, whilst Martinborough fruit is the source of one of my favourite North Island Pinots, produced by Craggy Range of Hawke’s Bay. Stalwart Martinborough Vineyards still produces sound wines. Pinot responds well to the careful hand-harvesting, yield management, and the traditional open-top fermentation employed by all serious producers of New Zealand Pinot Noir. Some excellent Pinots are also being made in Marlborough, Nelson and, in particular, Central Otago, the subject of another spotlight feature below. 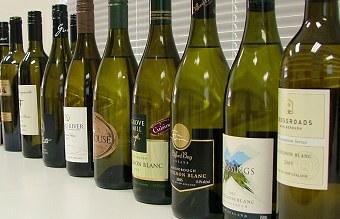 So there is diversity in New Zealand already, with newer regions coming through, a determined focus on certain new grape varieties, and a keen awareness amongst an open and enthusiastic winemaking community that this tiny wine-producing nation cannot rest on its laurels – and cannot bank on the world’s love affair with one grape and one style of wine forever. In our spotlight pieces, Paul Howard and I look at some of the New Zealand regions, grapes and styles, in a celebration of a beautiful land, whose winemaking potential remains relatively untapped. Certainly New Zealand is alive to the dangers of becoming a one-trick pony. Marlborough Sauvignon as a category is evolving and there are already wines that march to a very different beat: Te Koko from Cloudy Bay is barrel fermented and aged, whilst the Biodynamic wine from Seresin Estate is fermented using wild yeasts and also spends time in French oak. More restrained, less obvious Sauvignon is being produced too, including the wine from Clos Henri, the New Zealand outpost of Sancerre’s Henri Bourgeois. Almost all producers feature Sauvignon Blanc heavily within their portfolios for now, including many from other regions who buy grapes or juice from Marlborough just to get that magical name on their label. But some I spoke to feel coerced into this by market forces: their real passion – and their real strength – lies in other grapes and other styles. But love it or hate it, one thing’s for sure: New Zealand Sauvignon Blanc – and Marlborough Sauvignon in particular – has done the almost impossible and shaken off its French roots to carve a whole new wine style for the 21st century. And that style – so far at least – cannot be equalled elsewhere. Very attractive, relatively passionfruit and tropical styled wine, with toned down herbaceousness, but plenty of pungent, gooseberry and greengage fruit. The palate has a fine balance between a suggestion of nectarine and waxy, ripe lime and lychee fruit, and a constrained minerality. Very intense. A classic grape of France’s Rhône valley, Syrah can trace its New Zealand ancestry back to cuttings first imported in the 1830s. But Kiwi Syrah has a chequered history, with the cool, wet climate frequently producing thin wines that lacked colour. By 1984 interest in Syrah had waned. The only remaining vines were rescued from a viticultural research station by Alan Limmer, and replanted as a single row at his Stonecroft Estate in Hawke’s Bay. Hawke’s Bay is dry and sunny, and planting inland provided the extra heat that Syrah needs. In particular, the Gimblett Gravels and Ngatarawa Triangle areas are producing high quality wines of distinction. These are areas of stony gravel soils, the remnants of old river beds. Their low fertility and free-draining nature reduces vine vigour. In the last decade, Syrah plantings have grown by over 400 per cent, from 62 hectares to 264 hectares. Three-quarters of this is in Hawke’s Bay, with smaller pockets in Auckland to the north and Marlborough to the south. In style, Kiwi Syrah can be summed up with the phrase “New World fruit with Old World structure,” having much more in common with the Northern Rhone than with the full-on Australian Shiraz style. 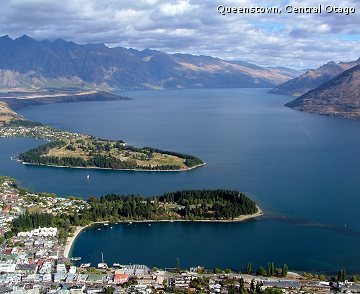 Central Otago is the world’s most southerly wine region, lying down amongst the snow-capped scenery of the Southern Alps. Otago has taken over the mantle of Pinot Central, not only for New Zealand, but also for the southern hemisphere. Winemakers Blair Walter at Felton Road, Rudi Bauer at Quartz Reef, Dean Shaw at the Central Otago Wine Company, Duncan Forsyth of Mount Edward and Matt Dicey at Mount Difficulty (amongst others) are all of a similar young age and ‘can-do’ outlook, with a fanaticism for Pinot Noir that is infectious. On a recent visit to the area, I discovered that Burgundy is very firmly the role model for all of these winemakers, most of whom have worked stints in the great Domaines of the Côte d’Or. The unique continental climate of the Central Otago region, with hot summers, cold winters, and large diurnal shifts in daily temperature, combines with schist and clay soils to yield a beautiful purity of fruit and distinctive expression of Pinot Noir. Though there is a tendency for some New Zealand winemakers to aim for too much colour and too much extraction in their Pinots, almost treating Pinot Noir as a ‘big solid red’, this is something to which most winemakers in Central Otago seem sensitive. Generosity, finesse and purity of fruit (with delicate use of oak) is a hallmark of the best wines. Waitaki, also known as North Otago, is sited between the sleepy towns of Duntroon and Kurow on the South Island, and its vineyards are causing a stir. Waitaki’s north-facing sunny slopes enjoy a mild climate suitable for producing fashionable ‘cool climate’ varieties such as Pinot Noir, Pinot Gris and Sauvignon Blanc. 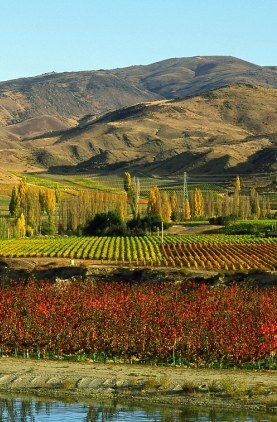 Compared with rapidly expanding Central Otago to the south, grape growing is less risky because of the moderating influence of the Pacific Ocean. The biggest single reason for all the excitement is the limestone-based soil. Limestone underpins the famous Burgundy vineyards, yet limestone in New Zealand’s grape-growing areas is extremely rare. Some leading lights of the New Zealand wine scene are already making wines from Waitaki fruit. At the famous Craggy Range winery in Hawke’s Bay, Steve Smith is making Pinot Noir and Pinot Gris, whilst Michelle Richardson, formerly award-winning winemaker at Villa Maria, has created Richardson Waitaki Pinot Noir. 2004 was the first commercial vintage released from Waitaki fruit, so it is too early to assess whether the limestone soils will be influential in creating a distinctive style. With the rapid expansion of new plantings and the sheer enthusiasm and pioneering spirit for which New Zealand wine producers are famous, it will not be long before the Waitaki name is better known. While not yet widely available in the UK, these wines are worth tracking down for their huge potential. Bright nose of red berries. Savoury, velvety palate, well balanced with herbs and spice on the finish. Fine grained tannins a touch dusty. 88/100. Not available in UK. Pale lemon green. Good varietal typicity, pears and quince to the fore. Fresh, intense and focused fruit, spice finish. 87/100. Not available in UK. Dessert wines are referred to as “stickies” down under, with over 100 different examples made in small quantities in New Zealand. A wide range of white grapes can be encountered – Riesling, Chardonnay, Sémillon, Sauvignon Blanc, Gewürztraminer, Chenin Blanc, Pinot Gris and even Viognier. Most come from Marlborough, although other regions produce superb examples too. Sadly, they are rarely seen in the UK: imports are currently restricted because the potential alcohol of these wines exceeds 15%. Nevertheless, they are worth seeking out. Stickies fall into two main camps. Firstly there is the late harvest style, where the grapes have been left to hang until super-ripe and raisined. These are generally gently sweet and delicate, with light fresh fruit flavours. Then there is the “Botrytised” style, as found in the great sweet wines of Sauternes. Capable of great age, they have a refreshing acidity to balance their intense sweetness and a powerful array of honeyed, dried fruit flavours. 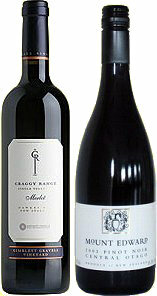 Both styles are ready to drink on release although the Botrytised wines will particularly benefit from bottle ageing. Light amber coloured Hawke’s Bay wine with tangerine and lime fragrance, botrytis depth. Tangy oily unctuousness, refreshing acidity, very long. 89/100. Not available in UK. This Hawke’s Bay wine, which is not yet commercially available, has a huge blossom-perfumed, rich intensity, apricots, peaches and great length. Stunning. 93/100. Experimental cask sample. From Martinborough, this has a honeyed pears and nectarine perfume, powerful lime and apricot flavours. Botrytis occurs most years. 92/100. Not available in UK.